From the Vendor: The name Ultra Enhanced Indo represents a supreme strain which has extra strength and potential. The user reviews suggest it to be the most potent Kratom strain. However, it is not an inbred strain and an artificially made strain. 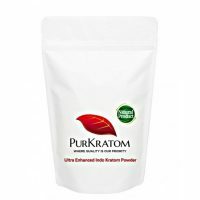 The word “ultra” and “enhanced” in the name of ultra enhanced Kratom suggest it be having additional amounts of benefits to offer. These advantages are mainly due to alkaloids. The ultra enhanced Indo goes through a process which adds 1500 milligrams of pure alkaloids to the already existing alkaloids. The strain which undergoes this process is the original strain of Indo Kratom. I’ve tried a lot of KRATOM from different vendors etc and I keep coming back to UEI. Four people in my family now use it. It’s expensivebut it works for arthritis pain. The kratom itself is excellent. It relieves my pain, gives me energy, and helps me focus. The kratom is a bit more pricey. However, you get what you pay for. This is the best kratom strain you can purchase. Period. This strain is beyond incredible and for advance kratom users only i recommend. Product is very potent on a low dosages. This strain can increase your tolerance levels substantially so its recommend alternating with standard powder. I suffer from severe chronic arthritis and fibro for the last 15 years.